This is a rather weird issue I'm dealing with. And, before anything, I would like someone to check that, if possible. Anyway, back to the issue. I can't open any videos from My Subscriptions feed on YouTube. When I try to do so, I get to this error screen. I don't have Flash Player installed and I don't want it either. I think HTML5 is the future and I'm glad Opera supports it. Also, I tried the same thing with the latest version of Opera (non-developer). And it worked ok. So it's not something specific to my account or my subscriptions. Also, I tried the same thing with Safari. And that worked as well. Also, uninstalled and reinstalled Oper Developer. With the same results. Also, what's really interesting is that this does not happen to all YouTube videos. And I couldn't find a pattern to which one of them work, and why, compared to the ones that don't. One example of such video that doesn't work with the latest version of Opera Developer, but works with other browsers, including the regular Opera browser, is this one. It's kind of annoying to switch between browsers all the time, when I need to watch a specific video. I use Opera for some features, I use it very often, and, until now, rarely used Safari. But this might change in the future if this kind of issues keep ruining the browsing experience. So let's hope someone figures out a way to fix it. 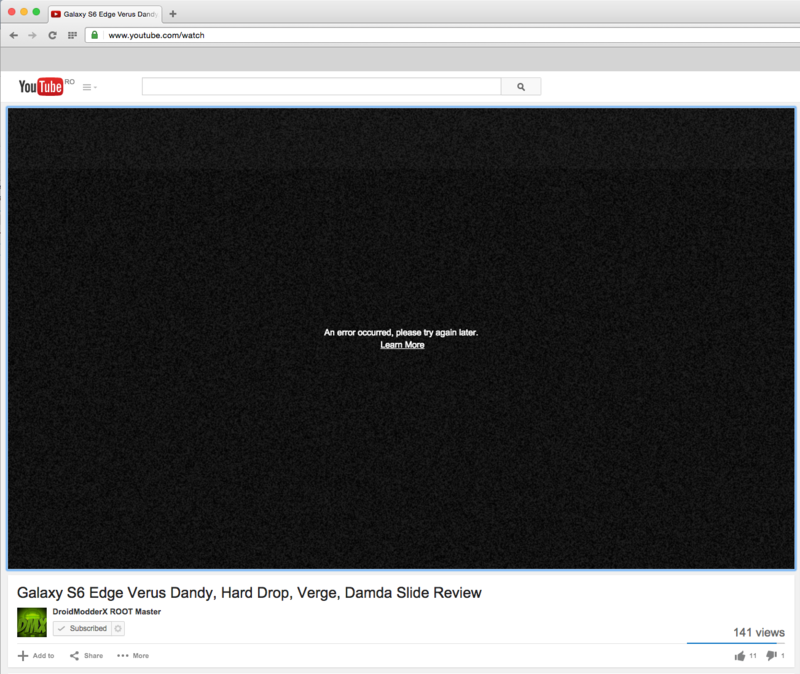 With the previous version of Opera Developer I had other YouTube issues (browser freezes). Now they're gone, but this new one came instead. Well, short answer? No. They are still non-playable in Opera Developer (even though now I'm using the latest version) and they are still playable (same videos, from the same location, played under the same circumstances) with the regular Opera browser. So right now, does https://www.youtube.com/watch?v=OVm_f9DMIOo work for you? (the link you posted earlier). I've tried that one with the HTML5 player in O30 developer, and I didn't see any problem. That one does work now. But the recent ones form My Subscription feed on YouTube (for example this one), still don't, not even if accessed separately. The one I posted above was also from my feed, but back then it didn't work, just like, right now, the one in this post, doesn't. At least for me. I'm not sure what's going on. Some videos (from other YouTube sections) work, whereas others, from the same section (different channel though) don't. So I made a video (mp4 for everyone's convenience), on a bunch of random channels from the "What to Watch" section of YouYube. And where some of them worked, some of them didn't. And what's even more interesting is the fact that I'm not even a subscriber of the channels of which videos didn't work (and no, accessing them again, won't make them work). Which doesn't really help, I know, since now we're not talking only about My Subscriptions feed anymore, but of a general issue, which still doesn't occur with the regular Opera browser. Anyway, the video can be found here. It does seem to be related to the format of the video, as said earlier YouTube makes videos available in other encodings later (and this can take quite some time). So it looks like some format isn't playing for you. What do you see when you go to https://www.youtube.com/html5 ? For reference, this is what it looks like in my O30 developer: http://imgur.com/6dG4F1p. After the error occurs, open opera://gpu/ and see problems detected. Then scroll all the way down to log messages. If there are any, post them here. I'm not sure how can it be related to that, since the same videos, played at the same time, in two different versions of Opera, have two different behaviors. One works, the other one doesn't. The HTML5 player is activated in both browsers. The only difference I found in terms of support is that Opera 28.0.1750.51 (regular version) doesn't have support for MSE & H.264 (not sure what difference does that MSE make, since it looks like it does have support for H.264 anyway), whereas Opera Developer does have support for all. Which is awesome and all. But still doesn't answer the question: how come the browser that works ok is the one with less support (regular Opera browser)? It's pretty counter intuitive. Also, if I'm not mistaken (which I might as well be), this issue did not occur in the past, with older versions of Opera Developer. I haven't used another browser as my number one browser, in a very long time. And I wouldn't have installed the regular version if it wasn't for this issue with YouTube. I would like to test an older version of Opera Developer, but not sure where I can get it from. Any ideas? Not sure that's gonna make any difference. But there is only one way to find out, right? Enabling ignore-gpu-blacklist didn't make any difference. So it's entirely possible that there's a problem with the new implementation on your system that didn't appear with the old one. Can you tell us more about which system you're using? Version of OS X, which Mac (you can use the description in "About This Mac" to identify the model)? Yes, I know it's not as easy as just "adding MSE". I work in IT. And I know that, sometimes, the smallest things can have the most unpredictable results. 30.0.1820.0 - MSE & H.264 support added -> YouTube issues. So I was right when I said that I don't remember having this issue in the past, with Opera Developer. There were no issues cause there was no support for that MSE thing in the past to cause the issues before. By the way, just out of curiosity, I checked the HTML5 support on the latest version of Safari. Let's just say I'm glad I chose Opera. Also, kudos for your hard work. And I'm on Mac OSX 10.10.3. Could you also tell us which Mac you're using (first line in "About This Mac") and which GPU you have ("About This Mac" -> "Displays")? a custom PC running Mac OS X 10.10.3. Video card: nVidia GTX 650 with 2048 MB of RAM. Also, additionally, I tested the same scenario on a Windows PC, which did not have this issue, despite the fact that the support for MSE & H.264 was there for this case, as well. I know that's off-topic for this thread, but just throwing it in there for comparison. So, as you can see, the issue is not hardware related. It's software related. And it does occur with both OSX 10.10.2 and OSX 10.10.3. Now, I'm really curious, do you guys not have this issue? Any of you? Cause I find it kind of hard to believe that I can reproduce it on two different machines, and no one can reproduce it on at least one, over there. If you need any more information, please, let me know. Yes, that's correct - we can't reproduce this on any of the Macs we have here. The HW video decode message you get is most likely the culprit: we have no fallback when that is the case, but we had never seen a real-life Mac without this feature. A 2010 iMac, we might have one of those around. Can you make sure that you get the same error message there? It's obvious why HW decoding is not supported there. But anyway, I already went ahead and took a screenshot from the 27-inch mac, just in case you guys might want that. And yes, it's exactly the same issue. And I'm pretty sure that once you guys my figure out the reason why this happens on the regular Mac, the issue will be also fixed on the custom build, as well. in console on your iMac?